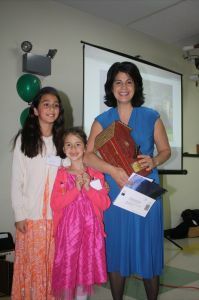 On May 3rd, Anjali Longan graciously received the NH Project Learning Tree’s 2012 Outstanding Educator of the Year Award. Anjali is a NH Project Learning Tree (NHPLT) Early Childhood Facilitator and Preschool Teacher at Chapel School in Nashua. She is pictured here with her two daughters, who were also in attendance to show their support. As a NHPLT Facilitator, Anjali was instrumental in helping to launch Project Learning Tree’s (PLT) new early childhood workshops in the state. She attended trainings, and spoke with local child care centers to gain support. Her enthusiasm for connecting children to nature is infectious and Anjali herself helped to train over 100 early childhood educators and parents in the first year! Whether I incorporate a simple activity, a song or a snippet of music, PLT is an integral part of my students’ day, everyday! Nature is a teacher’s best source of curriculum material. Nature is math, science, music, art, language arts, dramatic play, social studies etc. As our lives become more “connected” through technology we become further disconnected with the simplicity and beauty of the natural world around us. Often times, the classroom experience is the ONLY experience that some children may have with nature. Nature provides a template for creativity, wonder, experimentation and exploration that leaves a lasting, lifelong impression. Congratulations and thank you Anjali! Anjali is currently completing her Master’s Degree in Early Childhood Education/Special Education at Rivier College. She also teaches yoga classes at Hollis Yoga. She resides in Nashua with her husband and two beautiful daughters.